Do you need professional landscaping Clemson? Todd Cochran has over 20 years of landscaping experience, and ten years of experience owning Cochran Landscape Management, Inc. Todd graduated from Clemson University with a degree in Horticulture. Below is a list of services we offer when it comes to landscaping local properties. Cochran Landscape Management, Inc was founded on the principals of great design, and responsible landscaping practices. Responsible landscape design is more complex, often focusing on runoff paths, how the design will effect the surrounding environment, and how soils, plants, and animals will interact. Cochran provides some of the highest quality landscaping the area has to offer. Call us to schedule an estimate. Cochran Landscape Management, Inc has a lot of experience with landscaping design in the local area. Todd Cochran was educated in the Clemson area, making him extremely knowledgeable about local soils, plants, and animals. Landscaping design should take into account Clemson’s particular soil conditions for example. For some really great landscape design ideas, we’ve created this link to the HGTV landscaping web page. Water features are an unbelievably great way to spice up your outdoor landscape. We have experience installing large features such as waterfalls. Depending on where you live, water features can be a great way of attracting wildlife to your yard or landscape. We have been landscaping Clemson homes for decades now, water features are one of the best way to make your property stand out from the rest. Ponds and Waterfalls are a really great way to create the natural feel of running water right in your yard. We have installed ponds, waterfalls, and even features that resemble a babbling brook or creek. If you were lucky enough to grow up with a pond or creek in the back yard and your missing that at your home now, give us a call and we’ll see what we can do for you! Clemson residents install outdoor lighting in Clemson for a number of reasons. The two most common reasons being for safety, and for beauty. At Cochran we’ll combine the two, and take into account any and all other reasons that you might want outdoor lighting for your residence or business. Landscape lighting is a beautiful thing! Many of our clients who install landscape lighting love having people over in the evening, and landscape lighting can make all the difference in how your property appears. We make beautiful designs that highlight the great aspects of your property. 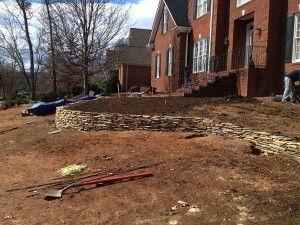 Call Cochran Landscape Management, Inc for all your landscaping Clemson, SC! You can see all our services here!